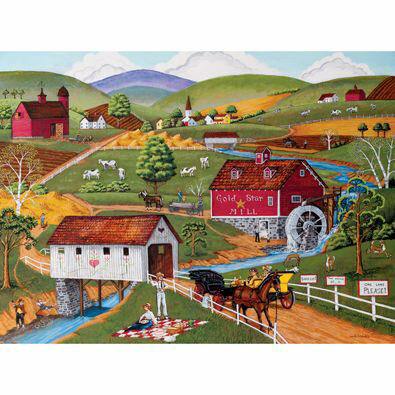 This 1000-piece jigsaw puzzle is designed by Joseph Holodook and measures 20" x 27". A river cuts through grassy green hills littered with farms. Harvest Moon Dinner Dance is a 1000-piece jigsaw is designed by Joseph Holodook. The farm is open for a community dance. The Scent Of Spring is a 1000 piece jigsaw puzzle designed by artist John Sloane. A young Amish girl seated on the porch steps has just gathered fragrant purple lilacs in a straw basket. Pink tulips, bluebells and dandelions surround the spring homestead scene.